The USBG-3X4M provides 4 downstream facing ports with standard Type-A USB 3.0 connectors. It supports screw lock features for both upstream (USB type B) and downstream (USB type A) connectors with the screw lock USB cables. It prevents from disconnecting the USB cables accidentally. With built-in single chip USB 3.0 controller, it works backward compatible either when any one of downstream port is connected to an USB 1.1 or USB 2.0 compliant device, or when the upstream port is connected to a USB 1.1 or USB 3.0 compliant host. Supports Self-powered and Bus-powered modes. 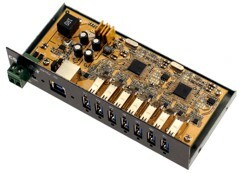 Supports 900MA Buss Power for each Downstream Port (When using external power supply).